I recently finished reading Tools for Rebuilding, a well known book in U.S Catholic leadership circles written by Fr. Michael White, pastor of the Church of the Nativity in North Baltimore, and his assistant, Tom Corcoran. If you are unfamiliar with this work, it is the sequel to the book Rebuilt by the same authors, detailing the re invigoration of the Church of the Nativity over the course of Fr. White’s tenure. The parish’s story is well known among bishops, priests, directors of religious education, youth ministers and others who seek to spread the Gospel in an increasingly secularized society. The entire Rebuilt movement is spreading through workshops given across the county and via social media. To be fair, I find much in the book worthy of reflection. Both Fr. White and Mr. Corcoran possess and promote a lively and orthodox Faith, which they refer to as “dynamic orthodoxy.” They took a failing parish and turned it around, tackling issues that many pastors and parish leaders might find overwhelming (only high school boys serves). Last Thursday, the Feast of St. Cyril of Alexandria, the Most Pure Heart of Mary Schola Cantorum was blessed to sing for a Pontifical Low Mass celebrated by H.E. Raymond Cardinal Burke at the Church of St. Anthony-St. Mary in Kansas City, KS. This was the first time the choir sang for Holy Mass celebrated according to the Ancient Latin Rite, and to be honest, I was a bit nervous about what all the children would think. In the end, the choristers gave the Lord some of the best singing they have ever produced and the Mass prompted one of the choristers to ask last Sunday if they could use the Communion Rail in our own parish from now on to receive Holy Communion (I took a poll, and all the choristers save one wanted to continue the practice). We shall see what the future brings. For my own part, I have sung for and lead numerous choirs singing sung Masses in the Extraordinary Form, but never Low Masses (this Mass being the first). The Schola Cantorum sang Tallis’ If Ye Love Me before Mass, Grieg’s Ave Maris Stella during the Offertory, the traditional chant Adorote devote, Messiaen’s O sacrum convivium and Mawby’s Ave verum corpus during Holy Communion and Holy God, We Praise Thy Name for the Recessional, immediately followed by Scarlatti’s Exultate Deo. While the choir sang everything very well, I have to admit that I missed singing the Ordinary and Propers of the Mass. It made me realize how much more I prefer singing the Mass instead of singing at the Mass, whether or not the Ordinary or Extraordinary Form. Nevertheless, I told Cardinal Burke that is was a blessing for us to sing for the Mass and assured him of our prayers. He graciously joined us for a picture, which I would like to share with everyone. The casual Reader might perhaps mistake me as a died-in-the-wool anglophile in the realm of sacred music, especially since I hold the English Choir School in such high regard, but let us face facts-the English cathedral system of forming church musicians works. I was reminded of this yesterday as I listened to an old BBC interview of Sir George Thalben-Ball describing how he landed the his position of 60 years as the organist and choirmaster at the Temple Church (named because of its original link to the Knights Templar) in London. While studying at the Royal College of Music, Thalben-Ball was called upon to fill-in for the afternoon service. He arrived at the Temple Church to find an orchestral score of Bach’s Mass in B Minor at the organ with a note that 10 movements would be sung that afternoon and that Thalben-Ball would need to transpose them all down a “semitone” because the organ was tuned almost half a step sharp. Thalben-Ball chuckled in the interview saying he must have decently well, since no one accosted him after the service, although he admitted to playing (transposed down a half-step) from the choral score instead of the orchestral score. If any parish were to call and ask me to fill in that afternoon for a Sunday concert featuring 10 movements of the B Minor Mass and as an aside mention that I would need to transpose the entire thing down a half-step, I would quickly dismiss the call as a prank or feign illness. I simply wouldn’t be able to do it. 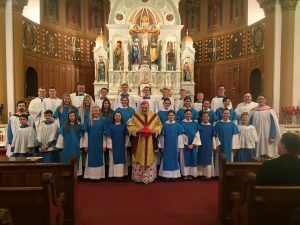 Had I been a choir boy and sung the Mass first as a chorister and then later as a choral scholar and had been playing and accompanying choirs to a high degree since I was in junior high I might have a chance, but that wasn’t the case. In that sense, I feel like a complete joke telling people that I am a competent church musician, much less one with a DMA. When it comes down to it, what do I really know?! Let’s face it, the English cathedrals know what they are doing and even on their worst days hit a mark of excellence that is simply beyond the reach of all but our best cathedral choirs in the US. Let us imagine for a moment a different situation. What if each of the 193 Catholic cathedrals (Roman Rite) in the United States were to model the English Cathedrals with a choir of men and boys and a separate choir of men and girls (and remember that most of them also have an excellent mixed choir to boot), where the boys and girls constantly rehearsed and sang the greatest music to the highest standards, especially the music native to the Roman Rite (Gregorian chant), took voice and piano lessons and sang daily for Mass and Vespers for the 5 to 6 years they were in the choir. In high school the girls would continue doing the same, while the boys would settle into their new roles as tenors and basses while singing the same music, only as a tenor or bass. A child who showed talent would begin studying the organ and playing and accompanying for services. When he went off to the university, each organist would receive a scholarship for playing for services for his separate college within the university, under the direction of a phenomenal choirmaster. After graduation, he would then be hired by a cathedral as an assistant organist and begin training the new singers as well (and he could, since he had been through the system himself and would be overseen by the director of music). He wouldn’t have to get a Masters Degree or a Doctorate in either organ or choral directing because he would have been singing in a professional choir and accompanying the same choir long before he even thought about shaving! It is nothing but the old apprentice system at work. Now imagine that happened at all 193 Catholic Cathedrals as well as our Catholic colleges, too. That is roughly 25 boy choristers and 25 girl choristers at each institution in one year. At the cathedrals alone that would be almost 10,000 children annually at least learning what good sacred music should sound like and having his/her moral imagination formed at the same time. Obviously only a small majority of those would go on to work in the field of sacred music, but even if it were 1%, that would mean 100 future professional church musicians, organists and singers, would be in formation each year (we aren’t even counting Catholic colleges). The other 99% percent would probably be open to financially supporting such a system because of the benefits they had received. So far the Cathedral of the Madeleine and St. Paul’s, Harvard Square are the only two who have joined the cause. I challenge every church musician today to begin forming our future musicians. It will change the face of church music in the US and will transform the lives and Faith of uncountable numbers of faithful. As Fr. Z says, just take the training wheels off and ride the damn bike!